Mesut Ozil celebrated helping Arsenal to overcome Watford by taking a trip out for a spot of lunch in London. The midfielder, who scored Arsenal’s second in the 2-0 win over Watford, treated himself by indulging in some traditional Turkish dishes on Sunday. 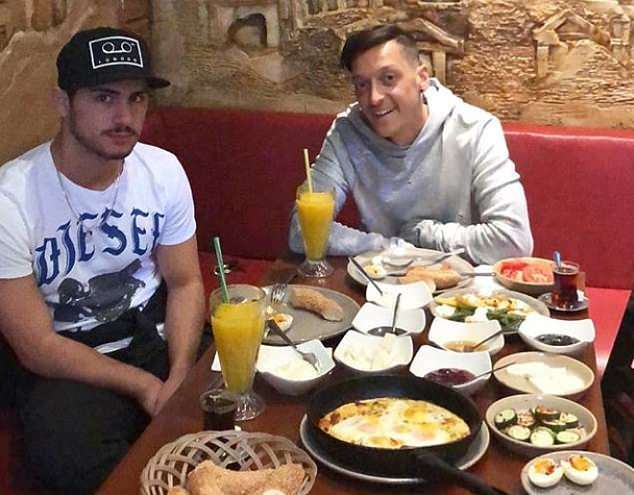 Ozil posted a snap on Instagram of him and a friend surrounded by a banquet of food as the pair dined out at the popular Likya Turkish restaurant in Golders Green. The Arsenal man, who was born to Turkish immigrant parents, has been regularly visiting the restaurant since joining the club back in 2013 and it has remained a favourite haunt for him. The 29-year-old will be glad to cap off his weekend with a good nutritious meal after starring in Saturday’s win. Ozil’s goal wrapped up the points after they had finally broke the deadlock against a dogged and resilient Watford through a Craig Cathcart own goal in the 81st minute. There will be no time for Ozil, who has found his form in recent games, scoring three times in his last four outings, to savour that victory with the action coming thick and fast. His and Arsenal’s intentions now immediately turns to Thursday’s Europa League tie against Qarabag.